Who could possibly afford to have a kid in Seattle these days? Quite a few people, apparently. In 1980, Seattle’s under-18 population stood at 87,000. Thirty years later, in 2010, it had only inched up to 95,000. And for the first half of the current decade, that number remained basically flat, even as the city grew at a record-breaking pace. Then, from 2015 to 2017, the under-18 population shot up to 115,000. Not exactly a baby boom, to be sure. Still, it’s a change, and passing that 100,000 mark again seems like something of a milestone. The city’s under-18 population peaked in 1960, when the census tallied 167,000 kids. They made up a whopping 30 percent of the city’s population at that point. Why so many children then? 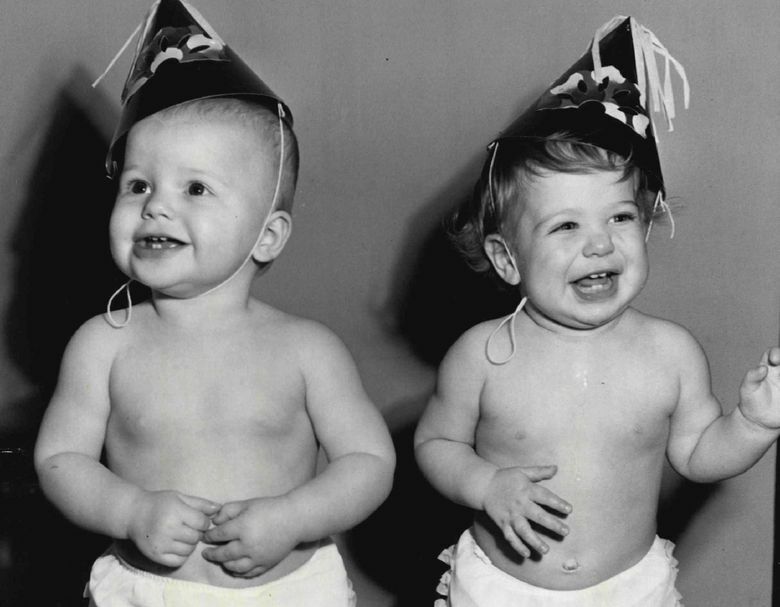 You guessed it: the baby boom. The 1960 Census reflected that massive increase in births that began after World War II. The boomers were all still under age 18 in 1960. From that peak, the number of kids in the city fell rapidly. Just 20 years later, the 1980 Census showed Seattle’s under-age-18 population had declined by nearly half. This trend was not unique to Seattle. What happened here was part of a broader demographic shift of (mostly white) families moving away from cities and into the suburbs, which were seen as healthier and safer environments for children, and with better schools. After 1960, Seattle’s population began a two-decade slide, while the suburbs grew rapidly. As many American cities revitalized in recent decades, they’ve attracted young singletons, college students, childless professional couples and empty-nesters back to the urban core. But families with children have not returned in great numbers. Seattle is among these cities that have remained relatively childless. In many urban neighborhoods, including my own (Belltown), kids are a rare sight. Dogs, on the other hand, are everywhere — and yes, it’s true that there are more dogs (roughly 150,000) than children in the city. Even with the recent, modest increase in kids in Seattle, only about 16 percent of the population is under 18. Among the 50 largest U.S. cities, that ranks as third lowest. San Francisco and Boston are the two cities slightly lower. Cities with the highest percentage of children tend to be in the Southwest, and have large Latino populations. The birthrate among Latina women has been higher than other groups, although that trend has reversed in recent years. One reason, surely, that cities like San Francisco, Boston and Seattle have a lower percentage of kids is that they’re very expensive places to live. So the growing number of children in Seattle in the last couple years is perhaps a bit surprising given how much pricier the city has become in that time. In a previous column, I looked at how the cost of living here has risen faster by far than in any other U.S. city. Then again, there are a lot more affluent people in Seattle than there used to be, and households with kids tend to be pretty well-off here. The median family income for households with children was about $127,000 in 2017. And for married-couple households with children, specifically, the median was $161,000. The great majority of Seattle kids — 72 percent — are being raised in married-couple households. 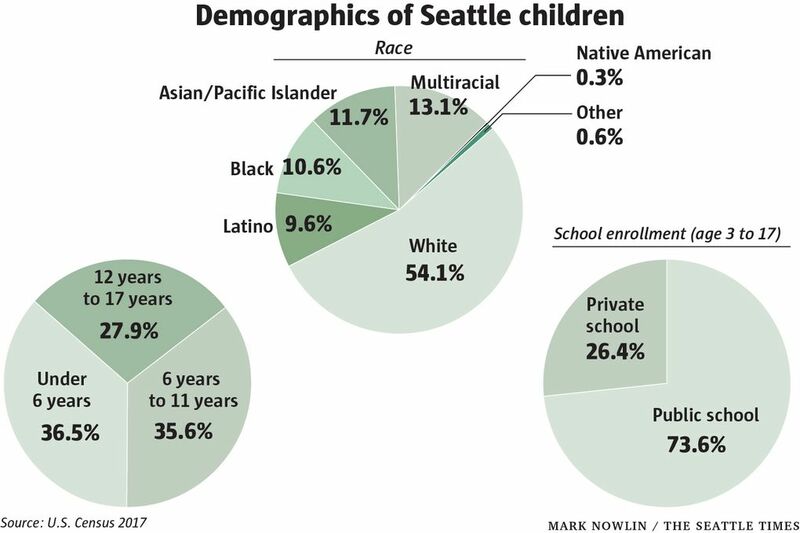 Another indicator of affluence: More than a quarter of Seattle school kids are enrolled in a private school, which is twice the national rate. Still, nearly one in eight children in Seattle live in a household that is below the poverty level. Most of these kids live with a single parent. The poverty rate is particularly high for single-mom households in Seattle, at nearly 40 percent. Census data show that the city’s most family-oriented neighborhood is in West Seattle, in the High Point area. One-third of the population there is under 18, according to census data. But if you prefer a child-free environment, Seattle neighborhoods offer plenty of options. 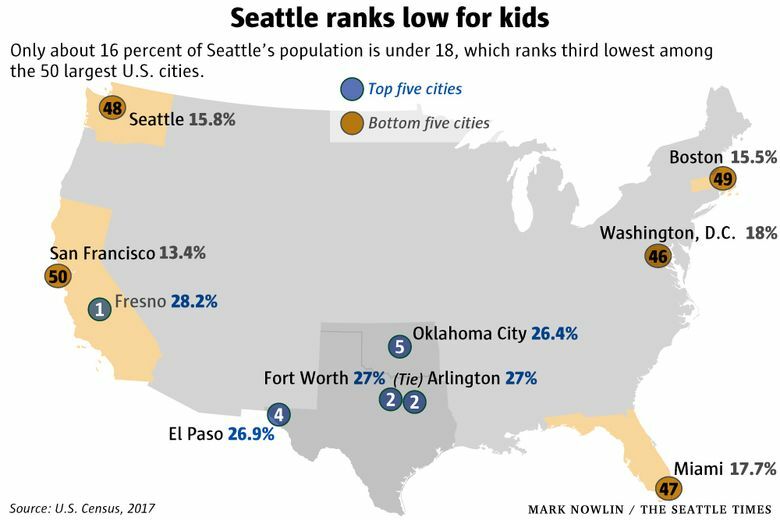 Topping the list is one neighborhood where only about 1 percent of the population is under 18: First Hill.